Serving Navarre, Gulf Breeze, Pensacola Beach, Destin, Fort Walton Beach and The Emerald Coast with excellence, support, and dedication. All your Real Estate needs in one place, Relocation, Houses, Condominiums, Lots and Acreage. Holley by the Sea 3 Bedrooms, 2 Baths + office, 2159-sqft on .46 acre lot with public sewer! 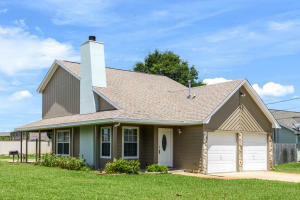 This home features NEW carpet, NEW paint and tile. Well designed split floor plan in Holley by The Sea. Great room features fireplace with mantle and high cathedral ceiling. Kitchen includes nicely sized breakfast room, hop up breakfast bar, stainless appliances including refrigerator and a pantry. Office with French Doors for privacy and Dining Room both feature tall windows. Great Room has high cathedral ceilings, plant ledges and access to screened porch. Large master bedroom is enhanced/w trey ceiling. Master bath includes double vanity, dual walk-in closets, garden tub and separate shower. Other features are irrigation system and the home has recently been pressure washed.Priced to Sell! Be sure to see this home newly painted in decorator color "sea salt" by Sherwin Williams. Nice! Enjoy all the amenities of Holley by the Sea's multi-million dollar recreation complex that includes boat launch, swimming pools, lighted clay tennis courts...state of the art work out equipment, locker rooms, steam room, and sauna, covered picnic pavilions, playground and Club House with views of the Intracoastal Waterway. Just minutes to shopping and the most beautiful beaches in the world. 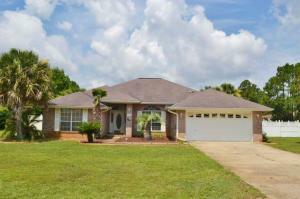 Great location in Holley by the Sea! 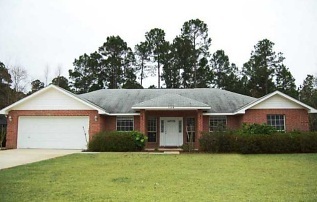 4 Bedroom, 2 Bath – 2275-sqft all brick home! Open concept light and bright floor plan features high cathedral ceiling, double French doors to patio, fireplace with mantle, and Formal Dining Room. The open plan makes this home a fantastic place to entertain. Island Kitchen with newer dishwasher, refrigerator, pantry and hop up breakfast bar offers easy serving. The breakfast room has a wall of windows and terrific view of the back yard. The Master Suite has its own wing and offers two huge walk-in closets, master bath with water closet, separate shower, garden tub and double vanity. This extremely well maintained and immaculate home features, 2016 decorator paint, 2014 energy saving impact tinted windows, French doors, large open patio, full irrigation system, gutter system and two car garage with attic storage space. Enjoy all the amenities of Holley by the Sea's multi-million dollar recreation complex that includes boat launch, swimming pools, lighted clay tennis courts, state of the art work out equipment, locker rooms, steam room, and sauna, covered picnic pavilions, playground and Club House with views of the Intracoastal Waterway. Just minutes to shopping and the most beautiful beaches in the world. Location! Location! Location! 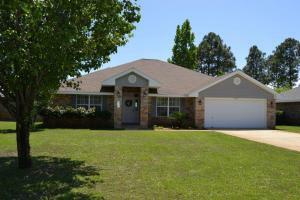 Close to schools, shopping, recreation center and golf course. 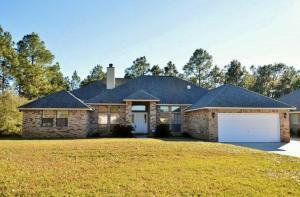 All brick home with NEW roof on over 1/2 half acre located in Holley by the Sea. 4 bedroom, 3 baths, 2,002-sqft situated on a large lot with privacy fenced back yard. The large Living Room features hardwood designed laminate, fireplace with mantle and glass sliding doors to the extra large open patio. The Living Room continues to the expansive Dining Room featuring another set of glass sliding doors and tile floors. The tiled kitchen boasts double wall ovens, cook top, stainless French door refrigerator, dishwasher, microwave, and double stainless sink. Lots of cabinets and counter space for cooking and storage! Tiled Breakfast Nook has bay window with great view of garden. 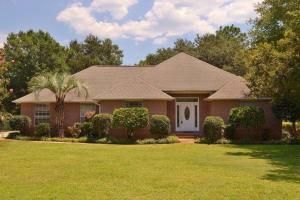 Sought after Location in Holley By The Sea! NO carpet in this well designed split plan allows 4 bedrooms, Formal Dining Room, Study and Great Room. Tile and wood designed laminate throughout. The Great room boasts a cathedral ceiling, corner tiled fireplace with insert, plant ledges and access to the large open patio. Spacious kitchen includes upgraded stainless appliances, breakfast bar, pantry, and plenty of cabinets. Breakfast Room has bayed windows for natural light. Huge Master suite has a sitting area, garden tub, separate shower, dual vanity, and large dual walk-in closets. Other features include large double gated privacy fenced back yard, lawn pump, sprinkler system, gutter system, large covered front porch with ceiling fan and a two car garage. Enjoy all the amenities of Holley by the Sea's multi-million dollar recreation complex that includes boat launch, swimming pools, lighted clay tennis courts, state of the art work out equipment, locker rooms, steam room, and sauna, covered picnic pavilions, playground and Club House with views of the Intracoastal Waterway. 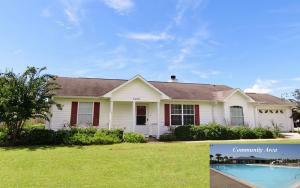 Only minutes to the pristine white sandy beaches and Emerald waters of Navarre Beach. Holley by the Sea 3 bedroom, plus office, plus large screened porch on .46 acre. Interior features include attractive 13'' tile floors in all wet areas, fireplace, high cathedral ceiling, many plant ledges, formal dining room, double walk-in master closets and security system. Appliances include refrigerator, dishwasher, smooth top range, built in microwave and upgraded granite counter tops. Kitchen also features breakfast bar and spacious breakfast room. Master suite includes a trey ceiling, two walk-in closets in the master bedroom and a very large master bath with garden tub, block window over the tub, separate shower, double vanity. French doors open to the large covered and screened porch with brick knee wall. The fenced back yard has islands of preserved natural areas that enhance the beauty and peacefulness of the yard. Home is on public sewer with new 2016 grinder pump. Plenty of room in the back yard for future swimming pool. For the multi-car household, an extra parking pad extends from driveway to side of home. The home has been pressure washed, deep cleaned and carpet has been cleaned. This home is move-in ready! Be sure to see! Enjoy all the amenities of Holley by the Sea's multi-million dollar recreation complex that includes boat launch, swimming pools, lighted clay tennis courts, state of the art work out equipment, locker rooms, steam room, and sauna, covered picnic pavilions, playground and Club House with views of the Intracoastal Waterway. Just minutes to shopping and the most beautiful beaches in the world. 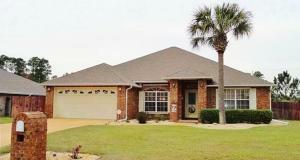 Waterfront community home on corner lot is convenient to Hurlburt, shopping and schools! Spacious 4 bedrooms home has newly renovated kitchen with tall soft close cabinets, granite, under mount kitchen sink, new microwave, stainless smooth top range, stainless dishwasher, and tiled backsplash and LG refrigerator. This home offers tile throughout the first floor, crown molding, spacious rooms, Living Room/Office, Formal Dining Room, Family Room with stacked stone fireplace with custom mantle, breakfast room with slider to patio, powder room, and extra large utility room with half bath. Energy saving windows installed in 2013. Upstairs is the Master Suite with high boxed ceiling and spacious Master Bath with double high vanity, jetted tub and separate shower along with 3 guest bedrooms and bath with skylight. This Waterfront community has sidewalks, underground utilities, and deeded access to Santa Rosa Sound. Be sure to see! Location! Location! Space and more space! Welcome to this beautiful Coastal Home with 4 bedrooms and 2 baths located in Legend Cove, a waterfront community with deeded access to the Santa Rosa Sound. Just a short walk to paddleboard, fish, or kayak right in your own neighborhood! Only minutes to beautiful white sand beaches, Navarre Park, shopping and only 15 miles to Hurlburt Field AFB. This home features many energy efficient upgrades including newer HVAC, newer roof with upgraded water proof barrier and hybrid hot water heater. Complete yard irrigation system on a well with sprinkler pump and zone control with automatic worry free timer. Inside, this home features a formal dining room with wood design laminate, open living room with wood design laminate, fireplace and double sliding glass doors to the back yard patio. Kitchen with breakfast bar and breakfast room includes French door Samsung refrigerator, drop in range, dishwasher and built in microwave.The laundry room is conveniently located off the kitchen and Master Bedroom. Extra cabinet shelving is located above the washer/dryer connection. Spacious Master Suite that feels like you own private retreat with trey ceiling, new wood design laminate,, sliding glass doors that lead out to the back yard patio and newly tiled master bath with large garden tub, separate shower, double vanity, and walk-in closet. The guest bedrooms have a wing of their own with bath. The guest bath has new tub and surround, tiled floor and new fixtures. 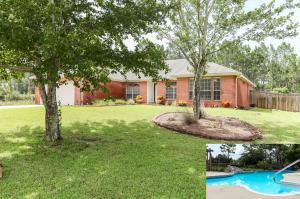 Large 1/3 acre with privacy fenced back yard mature trees and lush landscaping. Enjoy your view from the wooden swing. Custom built storage shed for extra yard equipment and tools. Lots of open room to play with a wooden playground set and slide.The home has been pressure washed and is ready for new owner to turn the key and move in. Well Located! 4 Bedroom plus office/den, 3 bath, 2430-sqft near everything! This home features cathedral ceilings, Formal Dining Room, Office/Den, Large Great Room and privacy fenced yard! Light and bright kitchen offers lots of cabinets and counter space with a pantry. The Master Suite has its own wing with two Master Baths and two walk in closets. One Master bath with garden tub and the second Master bath with shower. Other features include a workshop/storage with electric, yard aerated, lawn pump and sprinkler system, privacy fenced backyard and 2 car garage. Close to beaches, base, shopping and schools! Home has EXTRA 250-sqft gorgeous Florida room which is not included in the square footage above and looks out on beautiful landscaped yard with 18x34 salt water pool. This home is carpet free and features tile and wood design laminate throughout. The treyed ceilings and beautiful trim in this home is rarely seen anymore. Skylights are throughout the house. The Master has a large dressing area. VERY large walk-in closets in every bedroom. Painted in 2016, Updated ceiling fans, lighting, 2013 windows, Updated Kitchen with new hardware, 2015 washer and dryer, 2011 Water Heater and 2015 drain field, full irrigation system with 2014 Lawn Pump, 2008 siding and 2008 gutter system. 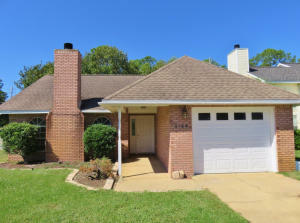 Upgrades Galore in this 3BR/2BA All Brick 1943-sqft Home! Holley by the Sea Amenities! This home features smooth cathedral ceilings, upgraded light fixtures, new plantation blinds, gleaming hardwood floors, tile – Kitchen, Baths, Laundry, Bonus, and crown throughout. Well designed split floor plan includes Formal Dining Room, Great Room, open Kitchen with Nook, Bonus Room and Large Master Suite with Office. 2012 granite Kitchen, tile back splash, disposal and stainless steel appliances including a 2015 refrigerator! Spacious open concept and Bonus Room make it easy to entertain. Hardwood Master Suite offers an office/den/bonus room and a Granite Master Bath with a large walk-in tiled shower, whirlpool jetted tub, dual vanities – one with sitting area, and a huge walk-in closet. Tiled Bonus Room with lots of windows brings added living space with natural light . 2016 A/C, 2016 irrigation well plus full irrigation system, Extra Concrete Pad & 2 Car Garage, Four Corner Security System, Chain Link Fenced Backyard & Yard Building, Open Deck & Patio compliment this home. Enjoy all the amenities of Holley by the Sea's multi-million dollar recreation complex that includes boat launch, swimming pools, lighted clay tennis courts, state of the art work out equipment, locker rooms, steam room, and sauna, covered picnic pavilions, playground and Club House with views of the Intracoastal Waterway. Just minutes to shopping and the most beautiful beaches in the world. 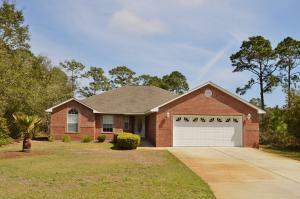 Charming, recently renovated all brick home is only 3 miles from Hurlburt field! 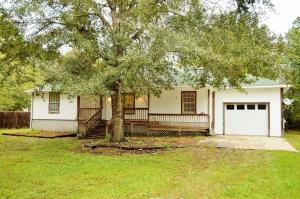 This 3 bedroom, 2 baths with screened porch and hot tub on large wooded, fenced lot. The Large Great room with high cathedral ceiling features floor to ceiling fireplace and plenty of room to kick back and relax with family and friends. Beautifully updated kitchen has island breakfast bar and stainless steel appliances, Granite counter tops, soft close cabinets and backsplash. The master bedroom is spacious and has upgraded bath with tiled shower. Wood designed laminate flooring throughout the living area and hallways. 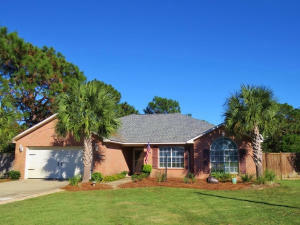 For convenience and location, this is the home you've been looking for along the Emerald Coast! Move In Ready! 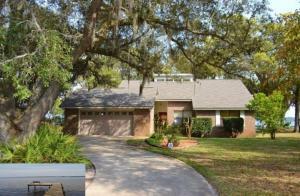 Cul-de-sac home in Waterfront Community with deeded access! Well designed 1,680-sqft,4 bedroom, 2 bath home provides split floor plan with new carpet, tile in bathrooms & wood laminate in living areas. Open patio deck and fire pit area completes the outside living space. This is a must see in West Navarre, only minutes to shopping, schools, bases, bay and beaches! 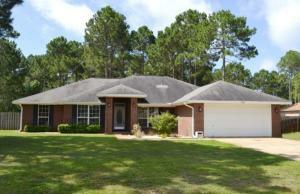 All brick home in Hampton Ridge Estates only minutes from shopping, Hurlburt Field and beaches! This popular 1,755-sf well designed floor plan has a great room, Dining area, 4 bedrooms/2 bathrooms, 2 car garage with side entry door, on premium corner lot with plenty of room to park your boat or RV. The master bath features double vanities, garden tub, separate shower, and a walk-in closet. This cul-de-sac home also includes French doors that exit to backyard patio, auto garage opener, lawn sprinkler system with well, lawn pump, fenced rear yard, public sewer and side entry garage. Near beaches base and bay-This is a must see! 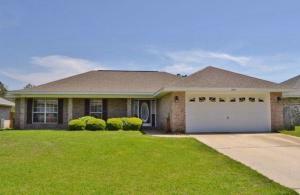 Cul-de-sac home in Waterstone subdivision, convenient to East Bay, shopping, schools & beaches. 4 bedroom, 2 bath 1,815-sqft home with huge deck for entertaining. Open floor plan with high cathedral ceiling, plant ledges and tiled dining area and kitchen. Kitchen includes breakfast bar, pantry, stainless steel appliances and tiled backsplash. Expansive breakfast bar opens to the dining area. Tile floors also accent the foyer, laundry room, and both bathrooms. The master bathroom has a double vanity, garden tub, separate shower and a large walk-in closet. Sprinkler system and lawn pump make it easy to care for your lawn and landscaping all year long. Other features are underground utilities, security system, brick exterior and a front porch great for your rocking chairs! 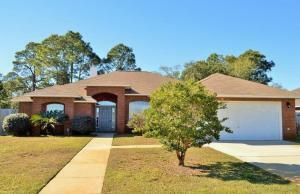 Gulf Breeze Updated 3 Bedroom, 2 Bath, 2 Story home in Villa Venyce! New Carpet, Newly Painted, New Stainless Steel Appliances! Updated Roof and Air Conditioning! Hardwood floors throughout the Living and Dining areas. Bull-nose corners! The Living Room features a brick fireplace with mantle and hearth. The Kitchen features tall oak cabinets with recently updated glass, Corian countertops, Kitchen Island, Deep sinks, microwave hood vented to outside, and lots of cabinet and counter space for all of your cooking needs. The 1st Floor Master Bedroom features a tiled sitting area and brick fireplace with mantle. The Master Bath has a marble vanity, garden tub, and walk-in closet. Guest bedrooms and bath are located on the 2nd floor. Other features are expansive open patios off the Living and Master Bedroom, Powder Room located off the kitchen, new glass in windows, newly sodded landscaping, new timer, new lawn pump, and extra wide driveway to side entrance 2 car garage. Great location is only minutes to shopping, schools and beaches. Be sure to see! Updated all brick home in convenient cul-de-sac location is ready to move in and enjoy! Large fenced back yard with yard building and a separate hobby/workshop building and covered lanai. Newly painted interior with hardwood laminate design flooring throughout the living area, kitchen and hallways, new carpet in bedrooms, new brushed nickel hardware, and new upgraded kitchen faucet. High cathedral ceiling, fireplace with mantle, and dining room area. Large kitchen with breakfast bar, new 2016 smooth top stainless range and spacious breakfast room. The master bedroom has two closets, tiled bath with double vanity, separate shower, and garden tub. Other features include 2014 lawn pump, sprinkler system, 2014 15 seer HVAC, 9x12 play house/hobby/workshop with window a/c, garage with glass sliders to large deck and deck off lanai. Tastefully decorated home is ready to turn the key and move in! Be sure to see! Upgraded home includes Holley by the Sea amenities! 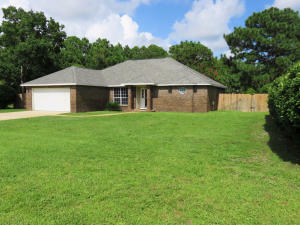 All brick 3 Bedroom, 2 Bath on almost ½ acre. Special features are washed wood design Pergo flooring throughout the living area and bedrooms, high cathedral ceiling with lots of recessed lighting, Plantation blinds, Formal Dining Room with columns, large Great Room, corner fireplace with mantle, double French Doors to Patio, Kitchen with upgraded LG Stainless appliances, glass tiled backsplash, Corian counter tops, pantry and under mount sink. The Master Suite has a wing of its own, walk in closet, Corian counter tops and dual vanity with custom glass vessel sinks with waterfall faucets. The baths and laundry feature tiled flooring. The back yard features 12x24 open Patio with 4 person SPA, vinyl picket fence with 2 gates, 11x14 paver Patio ready for dual sail shades and 4 raised bed gardens. Full irrigation system on timer with well. The home has been newly transferred to a public sewer connection. Ownership includes membership to Holley by the Sea's multi-million dollar 45 acre recreational center with 8 clay tennis courts, 3 swimming pools, full gym, aerobics, summer camp, lighted basketball courts, sauna & steam room, playground game room, community house on Santa Rosa Sound with playground, dock, access to the East Bay boat launch and many community events. Only minutes to the pristine white sugar sand beaches and emerald water of the Gulf of Mexico. Convenient East Navarre corner location with sidewalks. 2 story home with 3 bedrooms and 2 baths. Soaring great room ceiling makes this home feel much larger than 1300 sqft. Stone fireplace with mantle is nice accent. Dining area/ breakfast room open to kitchen with smooth top range, dishwasher and refrigerator. Wood design laminate throughout with the exception of the stairway to the 2nd floor. Master bedroom and bath are on the first floor and the master bath and guest bath are tiled. The exterior has been recently painted and there is a new leaded glass insert in the front door along with wrap-around porch and fenced back yard. New ceiling insulation added in 2005. The appliances were updated in 2005, dishwasher in 2009, roof 2005 and a/c in 2008. New sliders to outside porch were recently installed in 2017. Backyard has plenty of room for family activities. Be sure to see! Completely renovated 2015, 3 bed, 2 .5 bath Townhouse in Waterfront community with pier and pool on East Bay. Park in the garage and come into your light and bright open - concept living area. Delightfully interesting architecture and high ceilings makes this home stand out. Upstairs you will find high ceilings, spacious bedrooms and a guest bathroom. 2015 tile and carpet throughout. 2015 stainless steel appliances and backsplash in kitchen. 2015 updated ceiling fans, light fixtures and paint. Close to beaches, base, shopping and Hidden Creek Golf Course. This is a must see! Renovated! Move In Ready! Affordable! No HOA! 4 bedroom, 2 bath, 1944-sqft home on almost a ½ acre! 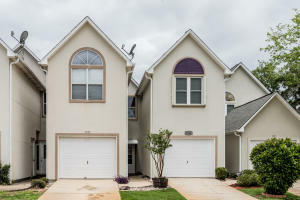 This home features tiled entry way, wood designed laminate, formal dining room, great room, spacious Kitchen with dining area, New exterior and interior paint, 2014 Kenmore Kitchen appliances, New Kitchen Nafco tile, 2016 washer and dryer, 2014 HR 50 windows, 2014 Rinnai gas tankless hot water heater, 2016 lawn pump, 2016 bath fixtures, 2016 master bath vanities, Screened Porch with lighted fan and skylight, covered front porch, circular driveway, metal port for covered storage, yard building and fenced in back yard. Close to shopping, schools, beaches, bay and base. This is a must see! 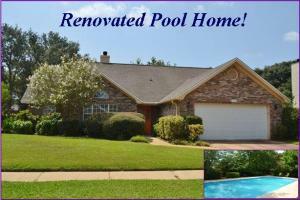 Pool home on cul-de-sac! Great location and has large 18x36 screened enclosed pool with expansive pool deck, tiled screened porch, fenced yard, 4 bedrooms, laminate and tile flooring throughout, high cathedral ceiling, spacious breakfast room, granite island kitchen, stainless dishwasher, microwave and smooth top range, and kitchen refrigerator that conveys. The master suite boasts double granite vanity, tiled shower with extra large seat and room size walk in closet. The guest wing has three bedrooms and a bath. 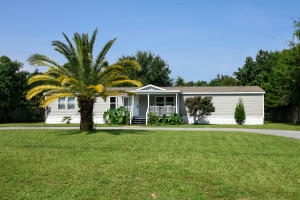 Other features are newer a/c, new pool pump, full irrigation system and yard building. 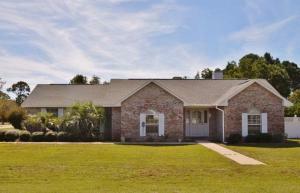 This all brick home has been upgraded from top to bottom and is immaculate. Only minutes to pristine white sugar sand beaches and emerald waters of the Gulf of Mexico, schools and shopping. The Breakfast Room features a large window and entrance to the large Backyard and Covered Patio. The Master Bedroom features trey ceilings, sitting area, large walk-in closet, and tall windows overlooking the large backyard. The spacious Cultured Marble Master Bathroom features a double vanity, linen closet, Garden Tub, and Separate Shower. The Covered Patio is perfect for entertaining guests while overlooking the manicured lawn of the privacy fenced backyard. Other features of this beautiful home are a side entrance of the 2 Car Garage, auto garage door opener, new hot water heater, full irrigation system and plantation blinds. You must see this beautiful home! 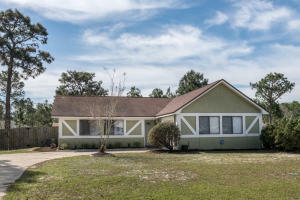 Lighthouse Pointe Subdivision is located off U.S. Highway 98 (Gulf Breeze Parkway) in South Santa Rosa County, Florida 1.5 miles east of the Gulf Breeze Zoo. This development resides on Santa Rosa Sound. The homeowners have access to the private water park with access to the Sound. They have picnic tables, a nice pedestrian dock, and lighted sidewalks. 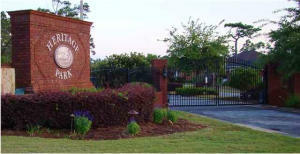 There are two gated children's playgrounds within Lighthouse Pointe. Project facilities include bbq pit/grill, deed access, dock, fishing, picnic area, playground, and waterfront location. Convenient to schools, shopping, Pensacola State College's Gulf Breeze campus, the Gulf Breeze Zoo, Navarre Beach and much more!! 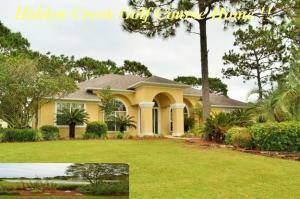 Gulf Breeze lake front home! This 4 bedroom, 2 baths brick home features an open floor plan, high cathedral ceiling, luxury plantation shutters, and wood designed laminate in the Great Room. The Living Room has views overlooking the large open deck and lake in the backyard. The spacious Kitchen with expansive breakfast bar features an island, pendant lighting, newer stainless steel appliances, built-in microwave, smooth stovetop oven, dishwasher, new tiled backsplash, and decorative plant ledges. There is plenty of counter and cabinet storage for all of your cooking needs! The Dining Room, adjacent to the Kitchen, features a large window, designer lighting, and French door to the new open deck and fenced backyard. The Master Bedroom features a trey ceiling with ceiling fan, and a large window overlooking the lake. The Master Bath features double vanity sinks, two large mirrors, linen closet, garden tub, separate shower, and water closet. The open deck is a perfect place to relax with views of tropical landscaping and the lake. Other features are tiled Kitchen, baths and laundry room, 2 car garage and irrigation system. This is a must see! Welcome to your private retreat with many windows, overlooking park-like setting complete with a 300 year old oak tree. Holley by the Sea, 3 bedroom 2 bath home has living room with tall 14-ft cathedral ceiling, bayed family room/den, dining room area completely open to living room with sliders to screened porch, kitchen with 2014 refrigerator, range and microwave, deep kitchen sinks, and spacious breakfast room. 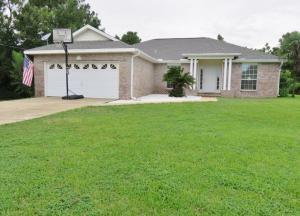 This home also features newer a/c, newer roof, irrigation system with well, and fenced back yard. Seller has handicap rails in baths, ramp to garage, and ramp to front porch. Such a great opportunity! Enjoy all the amenities of Holley by the Sea's multi-million dollar recreation complex that includes boat launch, swimming pools, lighted clay tennis courts, state of the art work out equipment, locker rooms, steam room, and sauna, covered picnic pavilions, playground and Club House with views of the Intracoastal Waterway. Just minutes to shopping and the most beautiful beaches in the world. Fisherman's Delight! Bring your RV, Boat, family & friends! Affordable Waterfront living on canal with boat dock only a short distance to Mulat Bayou and Escambia Bay where the fishing is great! Newly painted interior, newer windows throughout, newer a/c and new roof in 2015. The Living Room is open to the Dining Room with many windows overlooking the water. The entrance, hallways, Kitchen and Laundry Room feature wood designed tile. The cook will appreciate the GE gas stove and built-in microwave along with many cabinets and pantry. All appliances convey. Off the kitchen is a spacious sunroom with wrap around windows and tiled floor. The Master Suite features a sitting area and second closet. The Master Bath has a large step-in shower and walk-in closet. The Guest Bedroom has a walk-in closet and the Guest Bath is complete with a whirlpool tub. On the ground level is an enclosed workshop, covered storage/sitting area and covered parking area. This home also features a separate heating/cooling unit for the Sunroom. 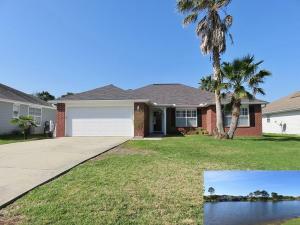 This is a great opportunity to have a Waterfront home on a cul-de-sac in a great neighborhood! With easy access to I-10 and Boat Landing with 2 launch areas, gazebo and dock is only minutes away! 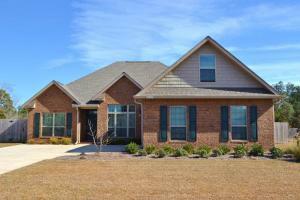 Cul-de-sac home at Tiger Lake subdivision! 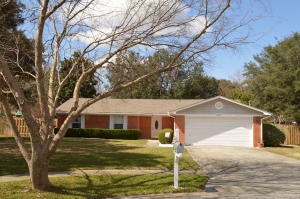 Florida living in this 3 bedrooms, 2 baths home is perfectly located next to the Tiger Point Park. This home features a split open floor plan, cathedral and vaulted ceiling with carpet and tile throughout. The Living Room and Dining area are adjacent to the open Kitchen. Arched windows bring in plenty of natural light into this area. Glass sliders, in the Living Room, lead to the open Patio to the privacy fenced backyard. The Kitchen features an expansive breakfast bar, plenty of cabinet storage, refrigerator, built-in microwave, dishwasher, and smooth stovetop range. The Master Bedroom, adjacent to the Living Room, has a high vaulted ceiling and large window overlooking the backyard. The Master Bedroom, adjacent to the Living Room, has a high vaulted ceiling and large window overlooking the backyard. The Master Bathroom features a double vanity, garden tub, separate shower, linen closet, and walk-in closet. Other features are a 2016 Water Heater, 2015 Air Conditioning Unit, 2015 Heating Pump, public sewer and public water, underground utilities, sprinkler system, lawn pump, and one car garage. The Tiger Lake community has a common area with a walkway around the lake with centered water fountain and spacious Gazebo/Pavilion. The long pier connects to this grand Gazebo and is perfect for a relaxing walk or watching the beautiful evening sunsets. There is a convenient walkway from the community to the Tiger Point Park which includes athletic fields, tennis courts, basketball courts, a 1 mile walking track, two playgrounds, and a new community center. You'll love this charming home within minutes to shopping, nearby base, and beaches! 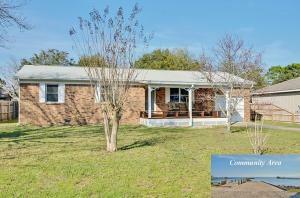 Conveniently located Carpet Free, 3 bedroom, 2 bath home with 10x21 Screened Porch on ½ acre fenced yard in Holley By The Sea! This home has an open concept with Living Room, Family Room and Dining Area all open to one another. The spacious Family Room features Cathedral ceilings, Fireplace with Mantle, and plant ledges. Updated Kitchen features granite countertops, tiled backsplash, under mount stainless sink, track lighting, updated cabinet hardware, newer Stainless Steel Appliances which include smooth top stove, dishwasher, built-in microwave, and refrigerator. There is plenty of counter and storage space for all of your cooking needs! The Dining Room, adjoining the Kitchen, has sliding glass doors opening to the Screened Porch. Screened Porch overlooks the large privacy fenced backyard, and is perfect for entertaining guests. The spacious Master Suite has a sitting area with a large window perfect for relaxing. The Master Bath features double vanity, custom mirrors, and garden tub. 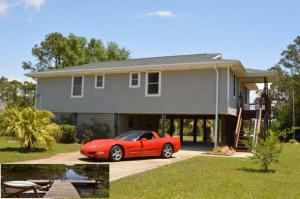 Other features include a 2 car garage, sprinkler system with well, and 2010 Air Conditioner. Your search is over! Come and see your future home in Holley By The Sea! Ownership includes membership to Holley by the Sea's multi-million dollar 45 acre recreational center with 8 clay tennis courts, 3 swimming pools, full gym, aerobics, summer camp, lighted basketball courts, sauna & steam room, playground game room, community house on Santa Rosa Sound with playground, dock, access to the East Bay boat launch and many community events. Only minutes to the pristine white sugar sand beaches and emerald water of the Gulf of Mexico. Affordable Upgraded corner home in Turkey Creek Estates! This 4 bedroom, 2 bath home features Cathedral Ceiling, updated Stainless Steel Appliances, extra large privacy fenced backyard with a Pergola covering the open Patio, and new Low E-Vinyl Windows w/ Plywood Hurricane Protection. The Kitchen features laminate countertops, tiled backsplash, Smooth-top Stove, dishwasher, built-in microwave, Pantry, and plenty of storage space. The spacious Family Room has Cathedral Ceiling, wood laminate floors, and ceiling fan. The large Master Suite has a sitting area and two large windows. The Master Bath features culture marble vanity, shower, and walk-in closet. The covered Patio features a Pergola covering that is perfect for entertaining your guests. The extra large privacy fenced backyard features a yard building for all of your storage needs. This home also features 2014 HVAC system, Irrigation System, and 2005 Roof! This home is a must see! Location! Location! Location! 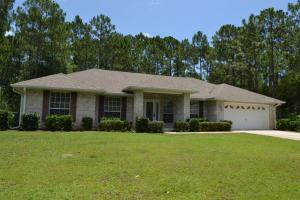 Close to shopping, schools, bases and bay! 3 bedrooms, 2 baths + small office or hobby room in this sqft light and bright home. This home features a well designed split floor plan with an expansive covered front porch, rear covered patio, open patio, large fenced back yard, fire pit, yard building, carport, full irrigation, gutter system and public water and sewer. Covered front porch entrance into the spacious living room with fireplace. Formal Dining Room, breakfast bar, pantry, laundry room, Master bedroom suite with master bath, two additional bedrooms and guest bath. Outdoor living space is convenient for entertaining family and friends. No HOA! This is a must see! 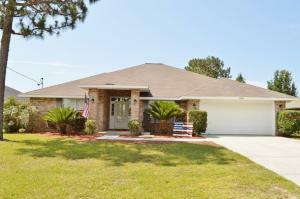 Light and Bright home in Holley by the Sea! Updated 3 Bedrooms, 2 Baths, 1120-sqft home has newer laminate in Kitchen, Great room and bedrooms, tile in baths and updated blinds. Kitchen has updated cabinets, counters, 2014 kitchen appliances, new plumbing fixtures, newer hardware and updated lighting. This home also features a security system, 2016 hot water heater, 2015 A/C compressor and thermostat. Master bedroom and bath offer walk-in closet. Enjoy all the amenities of Holley by the Sea's multi-million dollar recreation complex that includes boat launch, swimming pools, lighted clay tennis courts, state of the art work out equipment, locker rooms, steam room, and sauna, covered picnic pavilions, playground and Club House with views of the Intracoastal Waterway. Just minutes to shopping and the most beautiful beaches in the world. 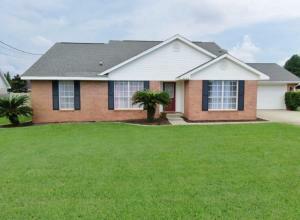 All Brick well located, well designed 3 bedroom, 2 bath – 1300-SQFT home! 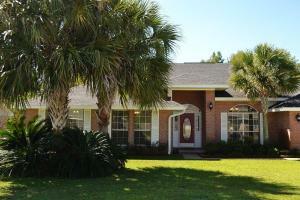 Walking distance to Woodlawn boat launch and Santa Rosa Sound! Spacious kitchen, nice sized Dining Room and Living Room offer ease of use and room to entertain. Good sized back yard and fantastic front porch adds value to the outdoor living space. Other features include a gutter system, 2015 A/C, 2014 water heater, NEW tile, NEW hardware in baths, NEW vanities in baths, NEW plumbing in baths, NEW lighting in baths, NEW ceiling fans and thermal windows. Boating and water fun is only .2 of a mile at the Woodlawn Beach Boat Launch on the Santa Rosa Sound! Near beaches, base and bay! A must see! Gulf Breeze Patio Home. 2 Bedroom, 1208-sqft home in Quail Ridge Landing! Many features include cathedral ceilings, a Great Room with fireplace, bright tiled Sunroom, Dining Room, light and bright kitchen with Whirlpool stainless appliances and an large open deck! Master bedroom has expansive vanity, double closet, privacy tub and shower. Other features include an additional guest bedroom, laundry room, one car garage, privacy fenced back yard with masonry detail, mature oaks and sprinkler system. 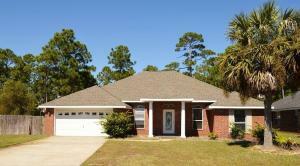 Minutes to Pensacola Beach, Pensacola Bay, East Bay, Gulf Breeze Zoo and Naval Oaks Nature Preserve! 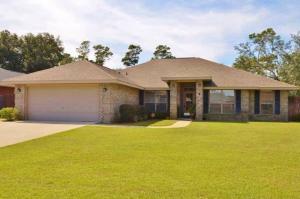 Inviting Golf Course Community Home in Hidden Creek !! Open light & bright 3 BR-2BA, 2359–sqft boasts inviting floor plan. Newly painted in neutral decorator color, hardwood flooring throughout the living area, dining room and office/den. New carpet in all bedrooms, raised 10-ft ceilings, tiled flooring in kitchen, breakfast room and baths, 3 sets of sliding glass doors, updated light fixtures, fans and plumbing fixtures. Enjoy entertaining family and friends or just relax with the wide open views throughout this home. The use of glass in the sliding doors, seamlessly blend the rooms with the outside and open to large screened porch. The kitchen features a spacious breakfast room, breakfast bar, wall oven and microwave, refrigerator, cook-top and many cabinets. Great room offers raised ceilings and two way gas fireplace shared by the office/den. The split bedroom design is accented by the generous sized Master Suite and includes a tiled bath, cultured marble, two separate vanities, one with make up seating area, separate shower, whirlpool tub, two walk in closets and glass sliding doors to the porch. The guest bedrooms and a guest bathroom have a wing of their own. Other features include newer a/c 2013, Roof 2003, Water Heater 2015, Refrigerator 2009, Security System , lawn pump & sprinkler system. Enjoy all the amenities of Holley by the Sea's multi-million dollar recreation complex that includes boat launch, swimming pools, lighted clay tennis courts, state of the art work out equipment, locker rooms, steam room, and sauna, covered picnic pavilions, playground and Club House with views of the Intracoastal Waterway. Just minutes to shopping and the most beautiful beaches in the world. Walk and bike along the water and enjoy the views across the Santa Rosa Sound to the National Sea Shore! Waterfront Community home features an open concept, large Great Room with high Trey ceilings and stack back sliders to the Covered Patio. Enjoy easy care Pergo wood block flooring throughout the Living Area and Bedrooms with tile in the baths and Laundry. The Dining Area is spacious and convenient to the Kitchen with breakfast bar. The Kitchen features all appliances including refrigerator, microwave, range, newer dishwasher and pantry. The Master Suite has high Trey ceilings, spacious bath with separate shower, long double vanity with makeup area, jetted whirlpool tub and two walk-in closets. The oversized Garage has a heated/cooled Hobby Room/Workshop area, separate electrical panel to plug in generator, floored attic space and laundry tub. Other features are Laundry Room with cabinets and Full Irrigation System. This wonderful neighborhood has street lamps, curb, gutters, and many natural areas. Incredible opportunity close to shopping, schools and beaches! 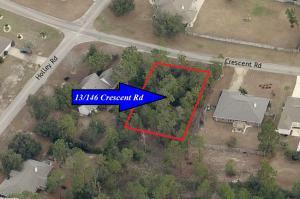 Popular East Navarre location in Creetwood Village! All brick 3 Bedrooms plus Office home features Formal Dining Room, Great Room with High Cathedral Ceilings, Fireplace with Mantle, Breakfast Room, new expansive Breakfast Bar, and Kitchen with all appliances including Smooth Top 5 Burner Range, New Bosch Dishwasher, New Refrigerator and New Kitchen Faucet. Master Suite features 2 Walk-in Closets, Dual Vanities, Garden Tub with Translucent Block for lots of light and Separate Shower. The Guest Bedrooms are spacious and have a wing of their own with bath. Other features are Dimensional Shingles, Ceiling Fans throughout, New Faucets for Master and Guest Bath and 2014 Lawn Pump. Great location! Great Home! Move in ready! Sought after location! 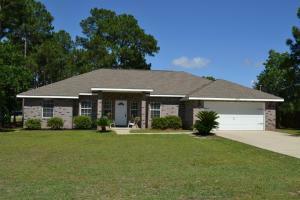 3 bedroom/2 bath light and bright well designed home in Gulf Breeze! This home features decorator paint, orange peel walls with knock down ceilings, step-up ceilings in Great Room and Master, archways, tile in Foyer-Kitchen- Baths and Laundry, deep base, recessed lighting maple cabinets with staggered crown, granite tops and breakfast bar, smooth top range, microwave, dishwasher, disposal, pantry, breakfast nook, French doors to patio and privacy fenced back yard. 2 car garage, lawn pump, sprinkler system and gutter system are included. 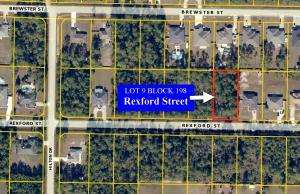 Windward Cove is a 2011 Cul-De-Sac Gulf Breeze community within walking distance to Oriole Beach Elementary, 2 miles from Oriole Beach Boat launch, has underground utilities and is near everything. A must see! Cul-de-sac location! Conveniently located 3 bedrooms, 2 baths home with high cathedral ceilings in the Great Room, tiled flooring throughout the living area and bedrooms. Kitchen with Breakfast Room includes range, refrigerator, dishwasher, and built-in microwave. The Screened Porch is convenient to the Great Room. 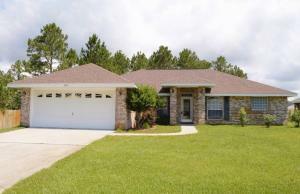 Recent upgrades with Rebuild NW Florida include a new garage door, new front door, and hurricane shutters. Other features include a Full Irrigation System with well and lawn pump, 2012 air conditioning unit, 2012 roof, and 2014 water heater (energy efficient). 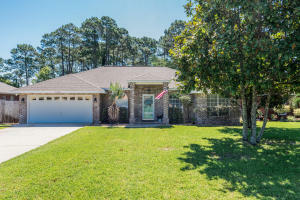 Lighthouse Pointe Subdivision is located off U.S. Highway 98 (Gulf Breeze Parkway) in South Santa Rosa County, Florida 1.5 miles east of the Gulf Breeze Zoo. CUL-DE-SAC home in Sidewalk Community convenient to bases, schools and shopping! 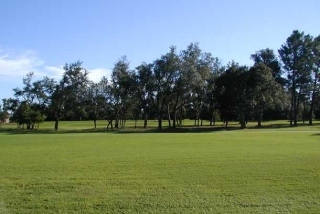 Wonderful yard with many trees is fenced with lots of room for family and friends. Great commuter location makes this a wonderful opportunity! Tile floors in all wet areas and the foyer, hardwood design laminate flooring in the great room and hallways with carpet only in the bedrooms . The kitchen features newer counters, black stove appliance and black range hood, newer dishwasher, pantry, breakfast bar and breakfast room overlooking the back yard. The great room has high cathedral ceiling and sliders to spacious patio. The master bedroom has double vanity and walk in closet. The guest bedrooms both have walk in closets.Other features are newer roof and a/c in 2005, and dishwasher 2013. $157,500 For full details, click on photo. Completely renovated move-in ready home in Waterfront Community! This 3 bedroom - 2 bath- 2 car garage -completely renovated patio home will delight you at every turn! 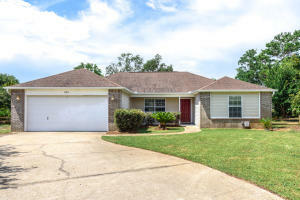 This home boasts new designer paint, new wood design laminate floor - entrance, new carpet, and new tile – Kitchen, Breakfast and Baths, new hardware and new lighting. The Kitchen features new tile, new hardware, new granite counter tops and back splash, new stainless appliances and washer & dryer closet. The Breakfast Room features bayed window, pantry, and shares a tile floor with the Kitchen. The Great Room boasts wood design laminate and opens onto a 10x20 patio. The Master Bedroom has new carpet and Master Bath with double vanity and large walk-in closet. Other features include a privacy fenced backyard and 2013 A/C. 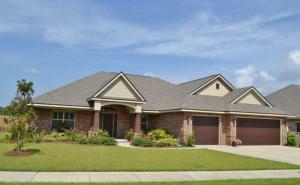 Lighthouse Pointe Subdivision is located off U.S. Highway 98 in Gulf Breeze. This development resides on Santa Rosa Sound. The homeowners have access to the private water park with access to the Sound. Project facilities include deeded access, pedestrian dock, fishing, picnic area, 2 gated children's playgrounds, lighted sidewalks, and waterfront location. Convenient to schools, shopping, Pensacola State College's Gulf Breeze campus, the Gulf Breeze Zoo, Navarre Beach and much more! 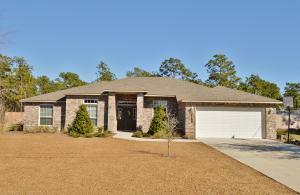 Tiger Lake Subdivision in the heart of Tiger Point in Gulf Breeze! 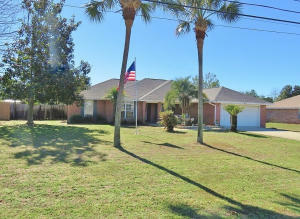 Florida Living in this 3 bedroom, 2.5 baths, 2 story home with first floor Master Bedroom in a desirable neighborhood! 2014 roof! Open floor plan with high cathedral ceiling, living room dining room combination, convenient first floor powder room, kitchen that features a new 2015 refrigerator, hardwood floors, breakfast bar, and French Doors to the patio and backyard. The kitchen features crisp white cabinets, pantry, and is desirable for all of your cooking needs. The spacious 1st Floor Master Bedroom with Bath features a separate shower, double vanity, walk-in closet, and large garden tub. The second floor features spacious loft, full bathroom, and two additional guest bedrooms. Tiger Lake community has a common area with a walkway around the lake with centered water fountain and spacious Gazebo/Pavilion. The long pier connects to this grand Gazebo and is perfect for a relaxing walk or watching the beautiful evening sunsets. There is a convenient walkway from the community to the Tiger Point Park with tennis courts, playground, basketball courts, baseball field, walking and running track and new community center. You'll love this charming home within minutes to shopping, nearby base, and beaches! 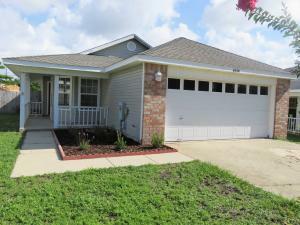 Affordable housing in East Navarre! 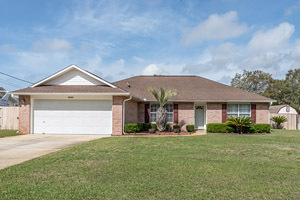 Brick front 3 Bedroom home has high Cathedral ceilings, newly stained Kitchen cabinets with brushed nickel hardware, 18" tile on the diagonal throughout the Living area and Kitchen, new 2015 stainless appliances, smooth top range, dishwasher & microwave, updated Plantation blinds throughout and new neutral decorator paint throughout. The Master Suite has Cathedral ceilings and new vanity cabinets. The fenced backyard and irrigation system are in place. The year of the air conditioning system is approximately 2009 and the roof is 2005. This home is move-in ready. Be sure to see! Country Charm at its Best! Priced right with a country feel within minutes to the Holley community boat launch! 2015 Air Conditioning and 2005 Architectural Shingle Roof! This 2 Bedroom, 2 Baths, 1370-SQFT home is a MUST SEE! The spacious covered porch is perfect for relaxing with that warm cup of coffee or for enjoying the evening sunsets. Stepping through the glass front door, you will notice the popular open floor plan of the tiled Great Room and the large Kitchen. The tiled Great Room features a beautiful fireplace with electric insert and art niche. Adjacent to the Great Room is the tiled Kitchen complete with a breakfast island. This large Kitchen features crisp white cabinetry, 2014 dishwasher, 2014 microwave, and a 2005 range. There's an abundance of storage space for all of your cooking needs! The Kitchen/Dining combo has glass French doors leading to the open deck and large backyard. This light and bright home comes with TWO Master Bedrooms. Each Master Bedroom comes with its own Master Bathroom! The main oversized Master Bedroom, adjacent to the Great Room and entrance to the home, is a spacious 17x15 tiled suite. This Master Bedroom also comes complete with its own French doors leading to the Master Bathroom. The tiled Master Bathroom features a whirlpool tub, double vanity, two large closets, and a separate make-up seating area. The 2nd Master Bedroom has a large closet and continues to the 2nd large bathroom with an extra large shower. Step through the French doors to the expansive open deck. Perfect for entertaining as it also features a staircase leading down to the extra large partially fenced backyard. The community has a public boat ramp and dock at the end of Live Oak Street to the East Bay. You can enjoy the beauty of the Bay and relaxing while fishing from the dock. This home is perfect for anyone looking for a great house in a great location! Call for your appointment with our agent today. 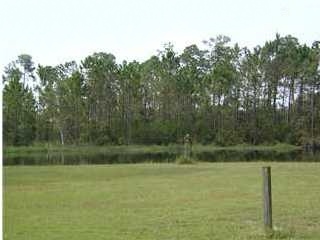 Well located GORGEOUS Lot ready for your home at Hidden Creek!! The Club at Hidden Creek received a 4 star rating from Golf Digest's 2006-2007-Best Places You Can Play, one of only 5 courses in the Panhandle to receive this award. Hidden Creek Estates is only minutes to the pristine white sugar sand beaches and emerald water of the Gulf of Mexico. Ownership includes exclusive membership to Holley by the Sea's multi-million dollar 45 acre recreational center with 8 clay tennis courts, 3 swimming pools, full gym, aerobics, summer camp, lighted basketball courts, sauna & steam room, playground game room, community house on Santa Rosa Sound with playground and dock and many community events. Waterfront Community! Deeded Access! Cleared! This .36 of an acre lot is nestled in Smugglers Cove. Smugglers Cove is a sound front community that boasts 66' deeded waterfront including 165' fishing pier, underground utilities and also a private club house, tennis court and pool. Just a short ride to the sugar white sands and sparkling Emerald Coast on the Gulf of Mexico. 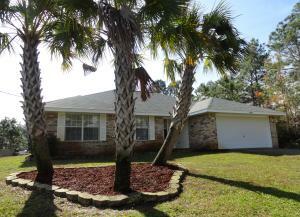 Close to beaches, bases, schools and shopping! Build your dream home here! Step inside your stylish 4 bedroom, 2 bath builder's custom home! This luxurious home features beautiful gleaming hardwood and tile floors throughout. The spacious Living Area features double trey crowned ceilings, romance lighting, a classic designed fireplace and entrance to outside enclosed patio. Complete with a chic granite wet bar, it is adjacent to the formal Dining Room. The sleek and stylish Kitchen comes equipped with stainless steel appliances: built-in microwave, smooth stove top, dishwasher and refrigerator. Also, a pantry, expansive kitchen island, wine refrigerator, sliding cabinet shelves and breakfast bar. 2 sets of glass doors seamlessly blend your favorite gathering spots. The extra large 1344-sqft screen enclosed patio has a hot tub, bbq pit/grill with granite dinner bar and extra seating includes cypress wood benches that are perfect for entertaining guests. Adjacent to the screen enclosed patio is the 326-sqft finished open porch. Enter the Master Bedroom through double French doors. The Master Suite boasts crown double treyed ceilings with romance lighting and a large walk-in custom designed closet. The Master Bathroom holds an oversized whirlpool tub and separate shower. The 3 additional bedrooms are perfect for guests/ family or use as den/office space. 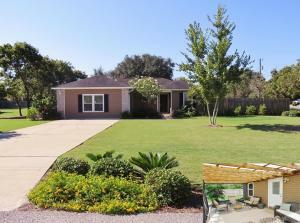 The lush, manicured backyard has a concrete & cypress wood private fence and comes with a yard building. Other features of this home are an oversized 2 car garage, possible rv/boat parking, security system, and a utility room with sink and cabinets. Let's not forget the storm low E impact windows! Close to beaches, bay, base, schools and shopping. This is definitely a must-see home! Build your dream home here! 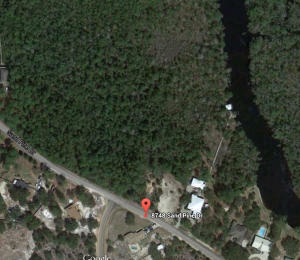 0.46 Acre beautiful lot available in Holley By The Sea! Ownership includes exclusive membership to Holley by the Sea's multi-million dollar 45 acre recreational center with 8 clay tennis courts, 3 swimming pools, full gym, aerobics, summer camp, lighted basketball courts, sauna & steam room, playground game room, community house on Santa Rosa Sound with playground and dock and many community events. Only minutes to the pristine white sugar sand beaches and emerald water of the Gulf of Mexico. 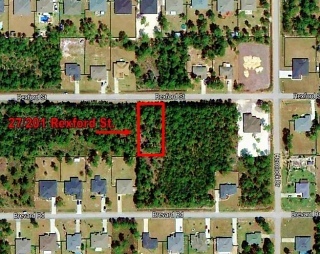 Corner lot with potential views of the Santa Rosa Sound is only one block from the water. A two story home with second floor deck will provide opportunity to bask in the sun and look out over the water. Waterfront community corner lot is cleared and ready to build! 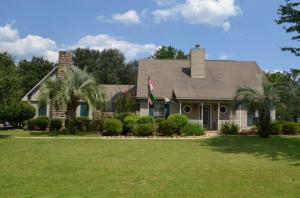 Located in neighborhood of beautiful waterfront homes. David's Landing is great life style neighborhood for walking & biking. 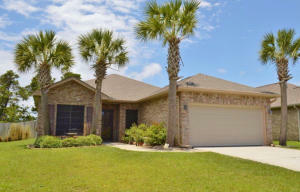 Neighborhood amenities include underground utilities, Gulf Breeze gas available, street lamps, curb and storm sewers. Minimum square footage in neighborhood is 1700 square feet. Many natural areas and convenient location to schools, shopping and beaches make this an incredible opportunity. Value Priced! 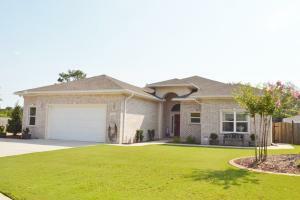 Waterfront Community home in Navarre, Florida. Sound Hammock features sidewalks, underground utilities, community Pool, community nature walk to Santa Rosa Sound and dock on the water. All brick home features 3 bedrooms plus office, formal dining room, & spacious great room with high cathedral ceiling & fireplace with mantle. Wood design laminate flooring is throughout the living area. Kitchen features bayed breakfast room, breakfast bar, pantry & all appliances including refrigerator, smooth top range and microwave vented to outside. Master suite has high trey ceiling, two walk in closets, double vanity, separate shower and garden tub. The guest bedrooms have their own wing with bath. Other features are newly painted interior, fenced back yard, laundry tub in garage, irrigation system with well and security system. 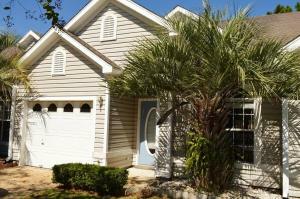 A/C 2004, and hurricane shutters Only minutes from schools, shopping and beautiful white sandy beaches. Opportunity to own well maintained home at affordable price. You must see this house! This gem is located in the popular Cottages at East River; an adorable and unique development just off the beaten path. This Craftsman home features 3 Bedrooms, 2 Baths, a popular Open Split Floor Plan, Crown Molding, Trey Ceilings, Decorator colors, beautiful Pottery Barn lighting throughout, 18" diagonally-laid tile in all wet areas, and Upgraded carpeting in all of the Bedrooms! This home is beautifully upgraded to suit the most discriminating buyers! The large Living area showcases high ceilings and beautiful hand-scraped Hickory Hardwood Floors adjacent to the Kitchen. The Gourmet Granite Kitchen boasts Espresso Cabinetry, Stainless Steel Appliances, gorgeous Mosaic Tile Backsplash, Under-Cabinet Lighting, Upgraded plumbing fixtures, Breakfast Bar and Pantry. The Dining Room features French doors leading to a Private Covered Patio and beautifully landscaped backyard. The spacious Master Bedroom features Trey Ceilings and sitting area. The Granite Master Bathroom features double vanities, jetted tub, two large walk-in closets, and linen closet. Only minutes to the pristine white sugar sand beaches and emerald water of the Gulf of Mexico and nearby bases! 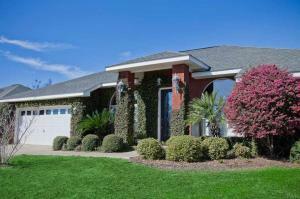 This home is a real beauty in East Navarre! Don't miss it! Cul-de-sac living in this 4 Bedroom- 2 Bath 2,557-sqft home, located in a desirable Waterstone subdivision! This home features a large screened porch, double French doors, solid wood cabinets, and a beautiful fireplace. The light and bright Great Room boasts a wood burning fireplace and cut outs in the wall to display your creative side. The kitchen has upgraded solid wood cabinets and black appliances to highlight the beauty of the wood. Storage is not an issue considering all of the cabinet and pantry space. Enjoy the formal dining room for a quiet cozy dinner with family and friends then relaxing in the formal living room. The large Master Suite offers a designer ceiling fan and an extra large window for natural lighting. The master bathroom has 2 walk in closets, double vanity, and a seated walk in shower. French doors lead to the enormous screened porch leading to patio for barbecue and sunning! This house is perfect for a family, with a playground in the back yard and 8-ft privacy fence. Close to beaches, bay, base, schools and shopping. This is definitely a must-see home! Hidden Creek Estates at Holley by the Sea! Welcome to your future home with panoramic views of the magnificent garden, 7th Fairway at Hidden Creek and lake. Step through the leaded glass Mahogany doorway to 10' ceilings of the foyer. This grand entrance to this beautiful 3 bedroom, 2 baths + office/study has an additional room that can be used as a hobby room or 4th bedroom. This home has heavy crown molding, high ceilings, plantation shutters, bull nosed corners, dramatic pillars, and tile. Geo-thermal system for heating & cooling is highly efficient for saving with low utility bills! The Great Room features a gas log fireplace and mantle surrounded by tile, glass shelves, and beveled mirrors accenting this grand room. The tiled Kitchen has an island, roll out shelves, microwave, convection wall oven, and a spacious breakfast room. The tiled Sunroom has a wet bar and a wall of windows overlooking the lush landscaping. The carpeted Master Suite has a sitting area, large walk-in closet, cultured marble, and a stained glass custom window above a whirlpool tub. The large backyard features a pergola, along with spectacular views of the 7th Fairway and lake. The 2 car garage has ample room and plenty of attic space. This is an exceptional home that offers relaxation, beauty, and comfort! The Club at Hidden Creek received a 4 star rating from Golf Digest's ''Best Places You Can Play'', one of only 5 courses in the Panhandle to receive this award. Hidden Creek Estates is only minutes to the pristine white sugar sand beaches and emerald water of the Gulf of Mexico. Ownership includes membership to Holley by the Sea's multi-million dollar 45 acre recreational center with 8 clay tennis courts, 3 swimming pools, full gym, aerobics, summer camp, lighted basketball courts, sauna & steam room, playground game room, community house on Santa Rosa Sound with playground, dock, access to the East Bay boat launch and many community events. Boater's paradise, access to deep waters! 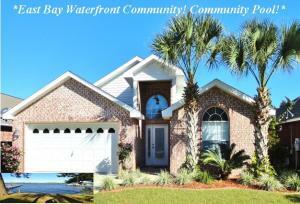 136-ft of WATERFRONT shoreline on intercoastal waterway! Kayak & boat to sugar sand barrier island across the sound! Desirable 1.27 acres with majestic Oaks, Magnolia and Muscadine grape arbor makes this natural retreat a perfect site for your home*. Pilings are in place for future dock. Plenty of space to play on the water and enjoy the proximity to beaches, restaurants, shopping and schools. An opportunity for those that value the beauty and tranquility of this great area. 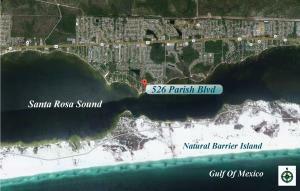 Parish Point is just a short drive to Hurlburt, or enjoy boating to Ft. Walton Beach, Destin, Navarre & Pensacola Beach. *Our team has worked with area builders for the past 18 years and we can help you find a builder who will help you work with your needs. 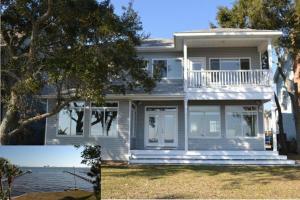 81-ft of Waterfront on East Bay with Seawall! .75 acre, 6-ft Effective Base Flood Elevation with No HOA and Midway Water tap fee already paid! The lot has been cleared of all overgrowth. A select combination of mature trees has been maintained, at the front of the lot, for added privacy. The remainder of the lot has been cleared of overgrowth and non-essential vegetation. The water frontage has been fully bulk headed using a vinyl seawall including rip rap for further enhancement. 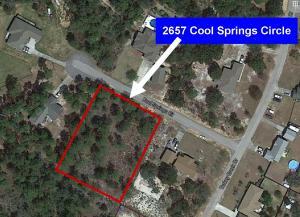 Located midway between Pensacola and Fort Walton, this lot is perfect for your dream home! Life just keeps getting better at Safe Harbour! Swim in the pool, fish off the dock, ride your bike, or walk around the complex and enjoy looking out over the water. 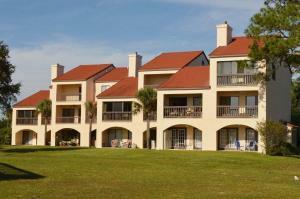 Safe Harbour Waterfront Condominium development on the Santa Rosa Sound features community pool and dock. 2 Bedroom, 2.5 Baths unit has amazing views of the water from the Living Room and Master Suite balconies. The large tiled Living Area adjoins the dining area and features sliding glass doors to the covered balcony. The Kitchen opens to a breakfast bar making serving to the dining area convenient. The powder room is convenient to the kitchen and living room. Appliances include range, microwave, dishwasher, refrigerator, washer and dryer. Move-In Ready! 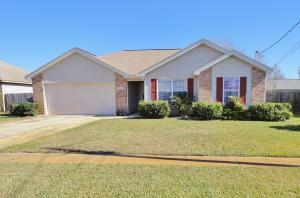 This 3 bedroom – 2 bath home features tile and laminate throughout the living areas and new carpet in the bedrooms. Well designed split floor plan with huge great room, formal dining room, bayed breakfast room, large master suite and Lanai. The Great Room features laminate, tiled fireplace, plant ledge, glass sliding doors, and built in cabinets. Kitchen has expansive breakfast bar, lots of cabinets and counter space for all your cooking needs. The bayed breakfast nook enjoys a glass door overlooking the lanai and large yard. Nice sized master suite includes a bayed sitting area, dual walk-in closets, tray ceiling and recess lighting. A cultured marble and tiled master bath features corner walk in full sized shower, large soaking tub and dual vanities. Mature landscaping compliments the privacy fenced backyard. Melissa Oaks subdivision has lighted sidewalks and is minutes from beaches, bay, schools and shopping! 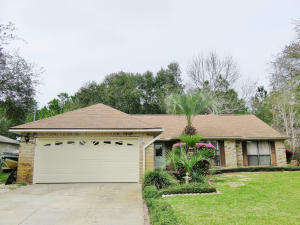 This all brick home on 1/2 acre corner lot has tropical landscaping with many palms and decorative fenced yard. The tiled foyer opens to the dining room and large great room with high cathedral ceiling, fireplace with mantle and plant ledges. The kitchen and spacious breakfast room feature diagonal tile, breakfast bar & pantry. The dining room is convenient to the kitchen and is complimented with wood laminate flooring. The master bedroom has a wing to itself and features a separate shower, walk-in closet and garden tub. Other special features are tiled walk ways, security system, extra large patio, deck and pool for entertaining. Ownership includes membership to Holley by the Sea's multi-million dollar 45 acre recreational center with 8 clay tennis courts, 3 swimming pools, full gym, aerobics, summer camp, lighted basketball courts, sauna & steam room, playground game room, community house on Santa Rosa Sound with playground, dock, access to the East Bay boat launch and many community events. Only minutes to the pristine white sugar sand beaches and emerald water of the Gulf of Mexico. Florida Living in this beautiful Pool Home! Desired Holley by the Sea Community! This well designed 4 bedroom- 2 bathroom, split floor plan, (salt water system)pool home features Bamboo and tile throughout (carpet in Master), decorator paint, updated ceiling fans, updated lighting, updated fixtures and hardware, CAT 5 wiring, 2015 Lenox AC system, 2015 hot water heater, full irrigation system, gutter system, security system and fenced back yard. The island kitchen has a breakfast bar, all stainless steel appliances, beautiful tile, a glass tile backsplash, extra deep double sinks, and a pantry. The large bayed breakfast nook overlooks the beautiful backyard. Great room is very spacious with a cathedral ceiling, fireplace, large plant ledge, and clear-view French doors that open to the screened porch! The large 2nd bath and laundry room were remodeled in 2010. The tiled laundry room includes cabinets, sink and counters. The master suite has double walk-in closets, garden tub, double vanity, make-up seating area, separate shower, linen closet and water closet. Enjoy the walkway from screened porch to gated arbor pool entry. Saltwater system pool with (2009) free-form vinyl is easy to maintain and includes pool sweep. Enjoy all the amenities of Holley by the Sea's multi-million dollar recreation complex that includes boat launch, swimming pools, lighted clay tennis courts, state of the art work out equipment, locker rooms, steam room, and sauna, covered picnic pavilions, playground and Club House with views of the Intracoastal Waterway. Just minutes to shopping and the most beautiful beaches in the world!! 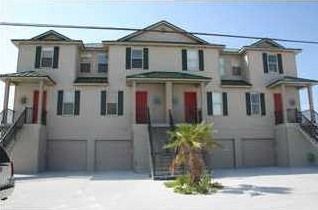 This is the best deal for a townhome on the Gulf of Mexico! Check it out and bring all serious offers! This is an end unit of a complex that has only four units. Enjoy the most incredible views of the Gulf and the Sound. Private 9x18 covered terraces on second and third floor. Custom features throughout with raised 10 ft. ceilings, crown moldings, recessed lighting and 20'' tiled floors. A large kitchen with island, stainless steel appliances, highly upgraded cabinets and granite countertops. The large master suite opens up to a private terrace and comes complete with walk in closet, large whirlpool tub and separate shower. Hardi Plank exterior, Galvalume metal roof, 6 ft. tall impact rated windows for incredible view and 8 ft. doors. Security system and integrated audio system. Huge 3 car garage. This is an end unit with 30 ft. of waterfront and maybe the best views of the beach. You must see this townhome if you are on the market to purchase luxury waterfront property! Updated and Move in Ready!! 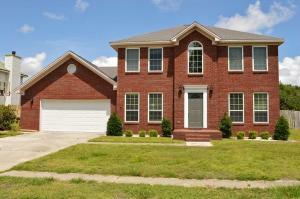 Turn the key and move in this 4 bedroom 3 full bath all brick home! 2430-sqft with a light bright and open floor plan. Features include new paint, deep rich porcelain tile floors and new carpet in the bedrooms. Upgraded light fixtures, ceiling fans, hardware & toilets. Formal dining room opens to the kitchen. The cathedral ceiling & raised breakfast bar makes for a roomy place to entertain. The kitchen also boasts tile backsplash, new counter-tops & loads of counter space and cabinets. Appliances: 2013 Dishwasher, 2014 built-in microwave, 2005 refrigerator & 2010 water heater. Exterior features include new fixtures, privacy fenced backyard with open patio, irrigation system, 2005 roof with 30-yr dimensional shingles & 2-car garage. Waterfront Community on East Bay with Pool only minutes from Hidden Creek golf course & pristine sugar white sand beaches! Upgrades galore, High ceilings, plant ledges, glass inserts in front door, upgraded carpet and recessed lighting above breakfast bar and cultured marble counter tops in baths. Italian tile in great room, dining area, kitchen, utility room, baths and hallways. Large dining area. Kitchen has upgraded alderwood cabinets, granite counter tops, Kenmore appliances, built in micro wave and pantry. Spacious guest bedrooms include cathedral ceilings. Upgraded a/c with Carrier Puron system that is environmental friendly. Interior walls are soundproofed and upgraded blown insulation used for both exterior and interior walls. 30 year architectural shingles. Close to bay, beaches, schools and shopping. Home is currently occupied. 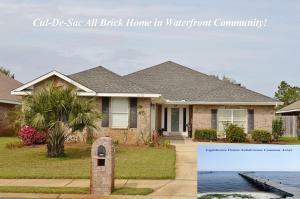 Waterfront Community, all Brick home, Split Bedrooms in Villa Danielle Subdivision! East Bay with access to the fishing dock! Well designed open floor plan and covered Lanai compliment this Florida home! The Great Room boasts an inviting tiled fireplace with mantle. You will notice the Kitchen and Breakfast Bar open to the Great Room. The spacious island Kitchen includes all appliances and plenty of cabinet/counter space for all of your cooking needs. The bayed Breakfast Room features large windows overlooking the privacy fenced backyard. The Master Suite and tiled Master Bathroom feature 2 large walk-in closets, double vanity, large garden tub, and separate shower. The covered Lanai is perfect for entertaining guests or just for relaxation. 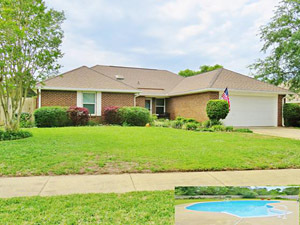 Cul-De-Sac living in this ***2015*** 2,375-sqft 4 Bedroom / 2 Bath All brick home! This home features a granite Island Kitchen with expansive breakfast bar, Formal Dining Room, Great Room, large Bedrooms, LED bulbs throughout, plantation blinds, tile in all wet areas and a huge 12x12 Lanai. Cook's tiled Kitchen with Breakfast Room features upgrades galore including premium staggered 42" Maplewood cabinets, stainless appliances and undermount sink. Huge Great room with plant ledges and upgraded lighting throughout! Master Suite with Granite Bath and 2 walk in closets, water closet, double vanity, garden tub and full size walk in shower. Other features include 12x12 covered patio/lanai, full irrigation system, 6' privacy fence with double gate and rear pedestrian gate, High efficiency HVAC system in the garage. Enjoy all the amenities of Holley by the Sea's multi-million dollar recreation complex that includes boat launch, swimming pools, lighted clay tennis courts, state of the art work out equipment, locker rooms, steam room, and sauna, covered picnic pavilions, playground and Club House with views of the Intracoastal Waterway. Just minutes to shopping and the most beautiful beaches in the world. Impeccably maintained! 4 Bedrooms plus office plus an enclosed tiled Sunroom located in the neighborhood of Brighton Oaks only minutes from the Hidden Creek Golf Course! This home offers manicured tropical landscaping. The Great room features high Cathedral ceilings, tiled electric fireplace and mantle, and opens to the Sunroom. This carpet free home has hardwood design laminate throughout the Living Room and Bedrooms. Custom tiled flooring is in the Kitchen and baths. The huge Kitchen Island offers lots of cabinets and counter space along with a Breakfast Nook and an extensive Breakfast Bar that the whole family can eat at. Newly installed top of the line Granite countertops and backsplash plus under mount deep kitchen sink and brushed nickel fixtures enhance the Kitchen. 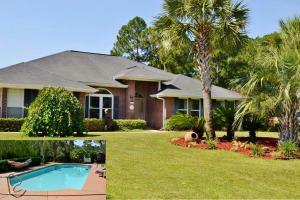 SHORT SALE - Pool Home! Move- In Ready! Holley by the Sea Amenities! Enjoy the water fun with the Gunite saltwater system in-ground pool! 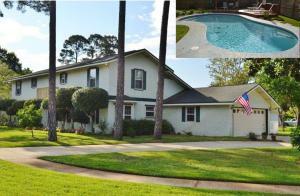 This well appointed 4BR, 3BA 2992-sqft home with pool & covered boat/RV parking has everything you have been looking for! Enter the home to a spacious open plan with a lot of room to entertain family and friends. Hardwood floors in the great room, dining room and master. Designer tile and carpeting in the rest of the home. Plant ledges with outlets, designer ceiling fan, surround sound wiring, tile walkways and access door to lanai and pool with a great view make the great room comfortable and convenient. The renovated Kitchen and Breakfast areas are enormous and feature a Granite Island with Breakfast Bar, designer Tile back splash and floors, a separate counter has yet another Breakfast Bar plus a large walk through pantry that accesses the laundry/utility room with sink (utility room refrigerator does not convey) offers freedom and functionality. Solid wood cabinets and stainless appliances including built-in microwave, dishwasher and refrigerator convey with this home. The huge Breakfast Room is adjacent to the Great Room and Kitchen and connects the two for easy entertaining. You will have great views of the Pool, Lanai and fully fenced back yard along with the open feeling of being part of the great room. Enjoy the private double fanned expansive pool Lanai with surround sound wiring and Gunite, saltwater pool with Cool Decking. Maturely landscaped with a variety of plantings & many palms. Principle features are: engineered hardwood floors; tile floors; huge lanai and pool patio; Gunite Saltwater system pool; 2010 High Efficiency Pool pump; 2012 Hi-Impact windows (except garage,great room and dinette); Full Bath Handicap accessible toilet and walk-in shower; 2 Master Suite Closets, Pool access from Master Bedroom and utility room; wired for surround sound in great room, master, garage and lanai; security system; full irrigation system; gutter system; covered parking behind fence; privacy fence and 12x24 yard shed. Enjoy all the amenities of Holley by the Sea's multi-million dollar recreation complex that includes boat launch, swimming pools, lighted clay tennis courts, state of the art work out equipment, locker rooms, steam room, and sauna, covered picnic pavilions, playground and Club House with views of the Intracoastal Waterway. Just minutes to shopping and the most beautiful beaches in the world. 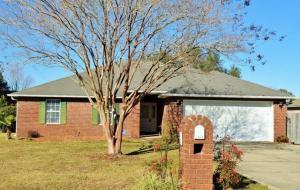 Newly updated and renovated home, conveniently located, in Marion Manor subdivision! This stylish 4 bedroom, 3 baths home is surrounded by lush landscaping and tropical palm trees accenting the entrance of this residence. Newly painted, new carpet, upgraded brushed nickel, and upgraded light fixtures throughout the home! It is a Wonderful Value! Step into the foyer and take in the very generous open floor plan connecting the Living & Dining Room to the Great Room. The large Great Room holds a fireplace with mantel surrounded by tile, and a convenient entrance to the open Patio. Hidden Creek Estates! 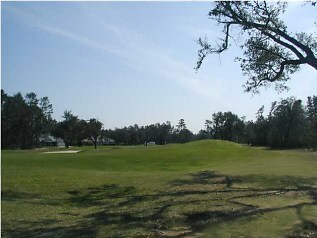 Beautiful lot on the 12 Fairway at Hidden Creek golf course. The Club at Hidden Creek received a 4 star rating from Golf Digest's 2006-2007 "Best Places You Can Play", one of only 5 courses in the Panhandle to receive this award. Hidden Creek Estates is only minutes to the pristine white sugar sand beaches and emerald water of the Gulf of Mexico. Ownership includes exclusive membership to Holley by the Sea's multi-million dollar 45 acre recreational center with 8 clay tennis courts, 3 swimming pools, full gym, aerobics, summer camp, lighted basketball courts, sauna & steam room, playground game room, community house on Santa Rosa Sound with playground and dock and many community events. 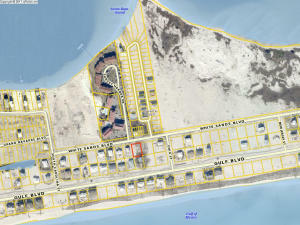 Beautiful lot available in Holley By The Sea! **Public Water - Public Sewer** Ownership includes exclusive membership to Holley by the Sea's multi-million dollar 45 acre recreational center with 8 clay tennis courts, 3 swimming pools, full gym, aerobics, summer camp, lighted basketball courts, sauna & steam room, playground game room, community house on Santa Rosa Sound with playground and dock and many community events. Only minutes to the pristine white sugar sand beaches and emerald water of the Gulf of Mexico. 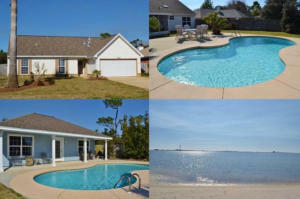 Located on the sparkling waters of Santa Rosa Sound, this home offers a magnificent beginning to each new day. Enjoy breathtaking sunrises from the balcony off the master suite with a morning cup of coffee or admire the vista through the expanse of windows that stretch across the entire back of the home. Perfect for entertaining, this home boasts an open floor plan, a professionally installed surround-sound system, a gas fireplace, and a gourmet kitchen. The chef in the family will delight in the gas-powered Viking stove with griddle, granite countertops, porcelain farmer's sink, and high-quality stainless appliances. Distinctive Tuscany inspired Pool home in Gated Waterfront community will inspire, invite and command your attention. Designed throughout with generous use of dramatic architectural details and captivating spacious living spaces that embrace the outdoors. Soaring 12 to 14-ft ceilings, deep baseboards, recessed lighting, Travertine tile floors throughout the living areas, grand arches and columns are just some of the luxury details. Formal living room with gas fireplace and leisure room with built-ins and entertainment center both with stack back sliders that open to the lanai with outdoor kitchen and enclosed Gunite Pool. Boater & Fisherman Paradise! Waterfront Pool Home with Dock & Boat Slip. 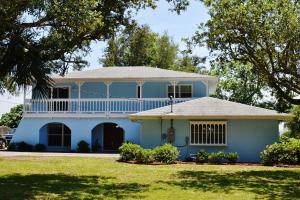 Newly renovated in 2005/2006 Spanish style home on almost ½ acre with large 8-ft deep Pool and large fenced yard with mature trees on the Santa Rosa Sound. The kitchen, dining room and family room open to the 44-ft screened porch that stretches the entire length of the home and offers lots of space for family and friends to gather. The home has two living areas, a living room that can double as an office and family room with floor to ceiling brick fireplace and hearth. The light filled kitchen is a cooks dream with newer Kenmore Elite double wall ovens, cook top, microwave, dishwasher and refrigerator. The kitchen also offers many cabinets, lots of counter space, a breakfast bar, corian counter tops, two skylights, vaulted ceiling and large breakfast room. Tiled flooring is in the foyer, dining room, kitchen, breakfast room, laundry, all baths and a downstairs 4th Bedroom. The 4th bedroom has an outside entrance and a shower. Just off the laundry is the bath with corian counter tops, and high double vanity. Upstairs is a spacious Waterfront master bedroom with large sitting area, that opens to the very large deck that runs the entire length of the house. Great Views of the water from the deck! The master bath has a high double vanity with corian counter tops and walk in closet. The large 2nd upstairs bedroom is is waterfront and has sliders that open to the deck. The 3rd upstairs bedroom has sliders that open to a balcony overlooking the front yard. Other features are extra large garage with storage room, seawall upgraded in 2005 with extra rip rap concrete, solid double front doors, new windows and doors throughout in 2005/2006, well, pump and sprinkler system and concrete pad on east side of house that is perfect for boat or RV parking. The home is conveniently located only a few miles from shopping, schools and the emerald waters of the Gulf of Mexico and pristine sugar sand beaches. 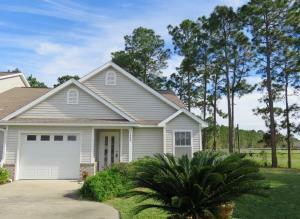 Welcome to your future home in Hidden Creek at Holley by the Sea! 4 bedrooms + office & 3 baths! Enter through the foyer to the open floor plan which features the Formal Dining Room on the right and optional Den/Study/Office on the left. The spacious Great Room has raised ceilings, a tiled fireplace with mantle, and a glass sliding doors leading to the large open Patio. Opening to the great room is the large granite Kitchen featuring maple cabinets, plenty of counter space, walk-in pantry, recessed lighting, tiled floor, wall oven, and multi-colored tiled backsplash that compliment the black granite and appliances. The kitchen granite island features a smooth cook top range and extra storage space which is a dream for anyone for loves to cook. POOL HOME! Florida living in a well sought after location! This 3 bedroom, 2 bath home has been newly renovated and is MOVE IN READY! This well designed home features Spanish lace ceilings, custom mantle over fireplace, crown molding, and beautiful wood cabinets. The newly remodeled kitchen is a dream to any chef with top of the line stainless steel appliances, granite counter-tops, large pantry, ample storage and beautiful tiled floor. The master retreat offers hardwood floors, a walk-in closet and a spacious bath that is newly renovated with double vanities, tiled jetted tub, separate shower, granite counter-tops and a window for extra light. 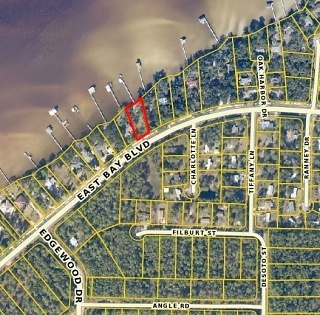 An opportunity to own almost an acre with 140-ft water front on Santa Rosa Sound! Huge property! The wooded .8 acre lot offers seclusion and the backyard trees frame the views of the intercoastal waterway. Breathtaking view from your master bedroom balcony! This 3212-sqft, 4 bedrooms, 3 bath home has ample living spaces with an open living room to dining room, family room and 23x24 recreation room. Inside you will appreciate the floor to ceiling wall of windows and vaulted beamed ceiling. The east wing is made up of a bedroom, full bathroom, and recreation room. The kitchen adjoins the family room with Brick wood burning fireplace and glass doors that take you to the patio overlooking the water. A screened porch is located. Find your new home in the picturesque neighborhood of Woodlawn Heights! Built in 2005 and featuring custom upgrades from the most recent owners, this home's layout, enormous backyard and proximity to excellent schools makes it perfect for an active family. Enter the front door into a high-ceiling foyer. On the left, a beautifully-appointed dining area waits, with attractive arched doorway to kitchen. On the right, French doors open to a lovely home office. The tremendous great room offers enough space to afford any furniture or decor. Windows overlooking the backyard let in abundant natural light within a sunroom to accommodate a breakfast room, family dining or a piano, as the current photos show. 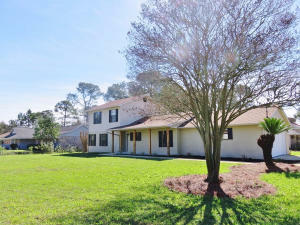 Enjoy peace and natural surroundings in this well located home with 2 sides privacy fence and rear protected wetlands! RV and Boat Storage! Gulf Breeze Schools! Close to Woodlawn Beach Boat Launch! Amazing entry with columned extra large front covered porch and three car garage. Grand Florida living with all the bells and whistles in this 3007-sqft home with columns, plantation shutters for office and dining room, designer tile, archways, step ceilings, crown, decorator paint, tile floors with travertine accent, bull nose corners, deep base, huge granite kitchen, enormous great room, guest wing and extended screened patio with hot tub. Possible 5 bedroom with guest wing, well designed open floor plan with 3 full bathrooms. French Quarter meets Contemporary in this majestic manor home. Dramatic architectural details and over the top amenities provide the essence of refined living. The Great Room and Dining Room flow freely into one another and provide a gracious atmosphere. This spacious home offers 4 Bedrooms, Office, 3.5 Bath, 3 Car Garage, and 3,250 sq ft. The open and inviting floor plan features a large great room with high detailed boxed ceiling, heavy crown and base, romance lighting, and tiled floors throughout the living area. The dining room boasts cypress hardwood floor and is convenient to butler's pantry with tall cherry cabinets. 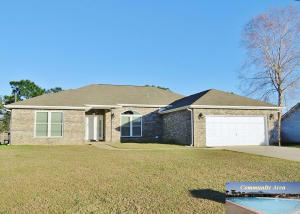 2013 home in Gulf Breeze cul-de-sac!! 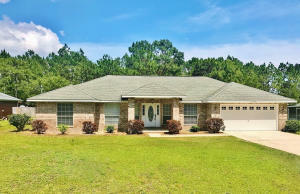 Beautiful Summerset Estates allows for convenient drives east or west, and is located near military bases Pensacola NAS, Whiting Field and Hurlburt Field, schools and shopping. 4 bedroom, 2.5 Bath plus office/den includes: formal dining room, office/den, great room, fireplace, high ceilings, recessed lighting, decorator color, tile, carpet, granite in kitchen and baths, brushed nickel door knobs, hardware and fixtures, Cheyenne style interior doors, powder room, laundry room, 2nd floor large bedroom/bonus and rear fenced open patio. Hidden Creek at Holley by the Sea. 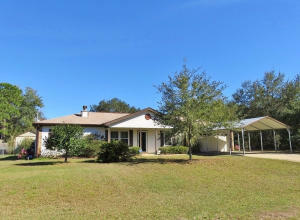 Spacious 4 bedroom plus office/den 2774 sq ft home on one half fenced acre with covered patio. Open floor plan has large island kitchen with many many cabinets and lots of counter space. The kitchen opens to extra large great room with fireplace. This open concept floor plan allows the cook to enjoy family and friends when in the kitchen. Large breakfast room is an added plus. The covered back porch extends almost the entire length of the back of the home. The master suite has a its own wing with dual closets, double vanity, make-up area, separate shower and garden tub. No carpet in the home! Porcelain tile throughout and new wood plank 3D hand scraped design tile in the bedrooms, laundry and baths. 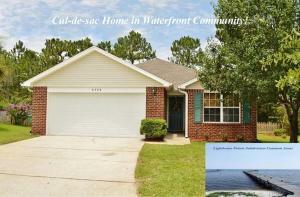 Waterfront Community with Deeded Access to Fishing Pier! This spacious floor plan brings the outdoors in with an oversized great room overlooking the sunroom and Lanai. The double side lit leaded glass door and tiled foyer set the tone for this well designed split bedroom home. Tile in foyer, kitchen, laundry and baths. 2013 Carpet in Great Room, Dining Room and Bedrooms. The large gourmet kitchen was renovated 2014. The granite counter tops, back splash and breakfast bar accent the maple soft closure cabinets. The double built in pantry, stainless appliances including a 2013 refrigerator, 2014 oven, dishwasher, microwave and all new hardware and sink make this a well functioning kitchen! Easily move from the kitchen to the breakfast room or dining room for meals and get-togethers. Waterfront Community! Pool! Guest House! Work Shop! RV & Boat Parking! 5 miles from Hurlburt! This is an updated 1816-sqft 3 Bedroom + Huge Bonus Loft – 2 Bath home and 807-sqft 2010 Guest House. 16x32 lighted Gunite 2010 Pool with 2014 Pool pump and pool cleaner. 16x30 Covered Boat and RV pad. 16x24 insulated and Air conditioned Workshop. This home features updated Kitchen and Bath, updated decorator paint, completely updated Master Bath and Updated maple hardwood designed floor throughout Great Room and Dining Room. The 2014 Remodeled granite island Kitchen includes soft close maple cabinets with crown, 2014 Kitchen Aide Dishwasher, 2015 LG Smooth Top Oven and Microwave. Great room offers shelving, fireplace and opens to screened porch. Soundside Neighborhood home with Deeded Access! 3 Bedrooms and 2 Baths on 1730 Square feet! This cozy brick home offers a private setting, with a spacious backyard. 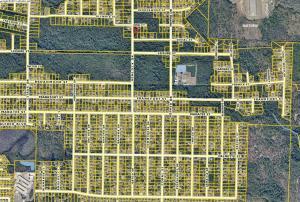 The land backs up to a 3 acre conservation area and is located on a corner lot! The large Great Room features Cathedral ceilings, built-in cabinets w/bookcase, and brick wood burning fireplace. Adjacent to the Great Room is the Formal Dining Room with designer lighting. The large Kitchen features a bayed breakfast nook, wooden cabinetry, and pantry. The Master Suite has a sitting area, walk-in closet, and French double doors leading to a large open deck. The tiled Master Bath features double vanity sinks, Jacuzzi tub, and separate shower. 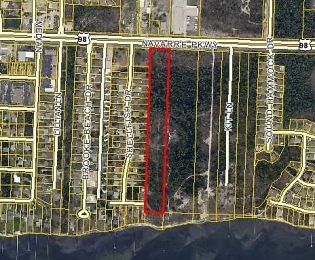 9.06 Acres with 200-ft x 340-ft of HCD Commercial, 7.5 +/- Zoned R-2 which allows up to 10 Units per Acre and Sound Front Parcel 200-ft x 190-ft with 200-ft on Santa Rosa Sound/Intercoastal. Less than 5% Wetlands and Wetland Report is on file. Utilities on adjoining property. The Sound Front property can be accessed from Shellfish Drive. This is opportunity to own parcel in prime location close to schools, shopping and pristine sugar sand beaches. 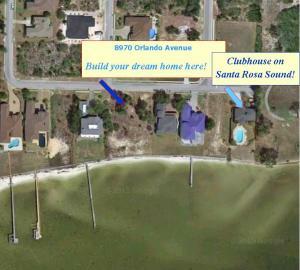 Santa Rosa Sound WATERFRONT LOT almost 1/2 acre! Gated Waterfront Community! 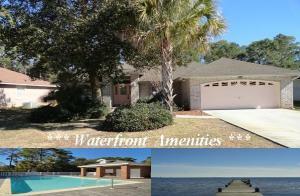 Conveniently located Waterfront Gated Community with Club House and Pool on the Santa Rosa Sound. Heritage Park has sidewalks, underground utilities, street lamps and is located only minutes to schools, shopping and beaches. This beautiful Waterfront Lot has a seawall and is ready for you to build your dream home. The Santa Rosa Sound/Intercoastal is convenient by water to Ft. Walton Beach, Destin and Pensacola Beach. 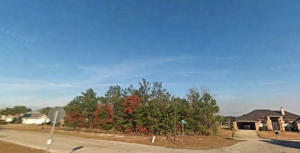 Beautiful lot available in Holley By The Sea! Ownership includes exclusive membership to Holley by the Sea's multi-million dollar 45 acre recreational center with 8 clay tennis courts, 3 swimming pools, full gym, aerobics, summer camp, lighted basketball courts, sauna & steam room, playground game room, community house on Santa Rosa Sound with playground and dock and many community events. Only minutes to the pristine white sugar sand beaches and emerald water of the Gulf of Mexico. Build your home here! Enjoy all the amenities of Holley by the Sea's multi-million dollar recreation complex that includes boat launch, swimming pools, lighted clay tennis courts, state of the art work out equipment, locker rooms, steam room, and sauna, covered picnic pavilions, playground and Club House with views of the Intracoastal Waterway. Just minutes to shopping and the most beautiful beaches in the world. 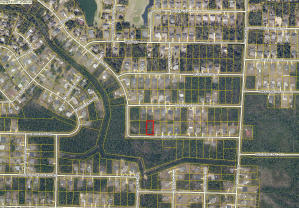 LOT ON THE CORNER OF OPAL CT. AND HEMLOCK DR.
One acre on a cul-de-sac street in East Bay River Estates. Close to Schools, Bases and Beach. Build your dream home and bring your horse! 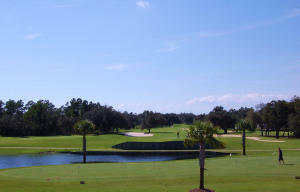 Hidden Creek Golf Course Lot on the 2nd Fairway is located on a Cul-de-sac with a view of the golf course and lake. There is a wooded section of the golf course that adjoins this lot. Holley By The Sea has a multi-million dollar recreation center with three pools, tennis courts, beach and picnic area on the Santa Rosa Sound. Well located on lot close to club house. Fantastic location on Hidden Creek golf course. Lot has sweeping views over the 7th and 8th fairways and lake. Hidden Creek will captivate your passion for golf and this beautiful wooded lot will be the perfect place for your dream home. The Club at Hidden Creek received a 4 Star Rating from Golf Digest's ''Best Places You Can Play'', one of only 5 courses in the Panhandle to receive this award. One of the best locations on Hidden Creek golf course. Lot has sweeping views over the 17th and 18th fairways. Hidden Creek will captivate your passion for golf and this beautiful wooded lot will be the perfect place for your dream home. The Club at Hidden Creek received a 4 Star Rating from Golf Digest's 2006-2007 "Best Places You Can Play", one of only 5 courses in the Panhandle to receive this award. 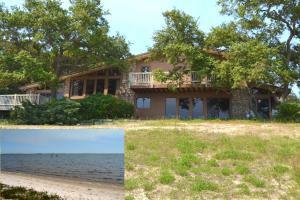 4.3 Acres with 330 waterfront feet on the East River. Build your private dream home here! 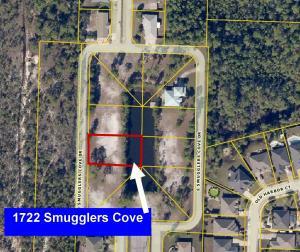 Building Lot in Gated Soundfront Community!!! 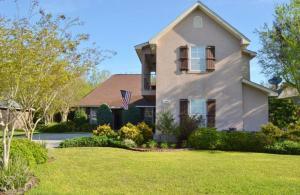 Gated Waterfront Community on the Santa Rosa Sound. Enjoy cobbled entry, sidewalks, underground utilities and Waterfront clubhouse featuring Pool, Workout Room, Conference area, Lounge with TV and fully fitted kitchen with beautiful views of the Santa Rosa Sound & steps from Pool area to the waterfront. Navarre is known as "Florida's best kept secret"…only a short drive to Destin or Mobile. Heritage Park offers underground utilities, public water and public sewer. Close to base, beach, shops and schools!! Prime Golf Course Location on Pebble Beach Drive in Hidden Creek Estates! Over 1/2 acre overlooking the lake on the Eighth Fairway. The Club at Hidden Creek received a 4 star rating from Golf Digest's 2006-2007 ''Best Places You Can Play'', one of only 5 courses in the Panhandle to receive this award. Hidden Creek Estates is only minutes to the pristine white sugar sand beaches and emerald water of the Gulf of Mexico. Ownership includes exclusive membership to Holley by the Sea's multi-million dollar 45 acre recreational center with 8 clay tennis courts, 3 swimming pools, full gym, aerobics, summer camp, lighted basketball courts, sauna & steam room, playground game room, community house on Santa Rosa Sound with playground and dock and many community events. 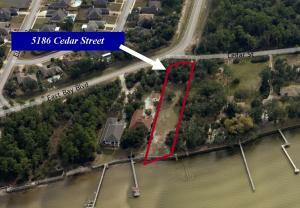 Waterfront lot on East Bay with 12-ft x 24-ft Covered Boat Slip, 200-ft Dock and 10-ft x 16-ft Platform Deck. This ½ Acre lot on East Bay has 111-ft of Waterfront and 5-ft Vinyl Seawall in place with Rip Rap. Perfect site for your home provides opportunity to enjoy Fishing, Boating, and watching the Dolphins & Pelicans. With the Dock and Seawall in place you can concentrate building your new home and meanwhile have some relaxation time on the Bay. 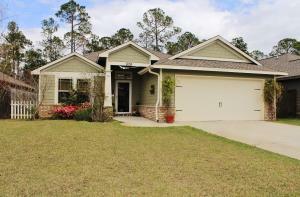 Located only minutes to Hidden Creek golf course, shopping, schools and beaches. What an opportunity to find a vacant lot with all of this in place. See it today! Price Below Market! Opportunity for buyers to add TLC! Cul-de-sac home in Soundfront Community with deeded access, sidewalks and park! Inviting covered mosaic slate tiled porch with columns lead to a designer etched glass front doorway. This 4 Bedroom, 2 Baths + Office, 2,080-sqft home features cathedral ceilings, hardwood/carpet/tile floors, bull-nose corners, and heavy crown molding! This popular open floor plan features hardwood floors, tile, Formal Dining Room with chair rail and bull nosed corners. The spacious office has a large custom built bookcase and desk with roll-out drawers. Adjacent to the office is the large Great Room with hardwood, built in entertainment area and a wall of windows and doorway to the covered Lanai and open patio. Waterfront home with 2014 dock! 120-ft of Bayfront! Fenced back yard! 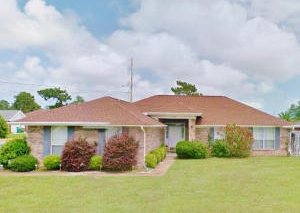 All brick home on East Bay has 3 bedrooms, 2 baths and 2 car garage.Treat yourself to panoramic views of the water and magnificent oak trees throughout the property. Enter into the side lit insulated door to the large foyer with coat closet. This home boasts tile throughout! The Great Room features large tiled fireplace with hardwood detail to ceiling, glass French door to the expansive patio. The Dining area features a great water view through bayed windows. The Kitchen features a breakfast bar, Stainless Dual Oven, Stainless French door refrigerator and dishwasher. Water views from master bedroom are spectacular, large closet and master bath with separate glass walk in shower and vanity are an added bonus. Pool Home! Guest Suite! Charming Hidden Creek home on .62 acre boasts a 16x30 Gunite pool with full enclosure (2003), a 4-person hot tub, extended patio and guest suite! 1,793-sqft 3 Bedroom-2 Bath home plus 600-sqft guest suite. The Guest Suite with bath and kitchenette offers complete privacy and self-sufficiency for guests. Gleaming hardwood floors in the living room, formal dining room, hallways and all bedrooms give the home a warm and inviting feel. The tiled floors in the kitchen and master bath have an elegant travertine look. There is a feeling of space with soaring vaulted ceilings in the living room and formal dining room. Renovated Florida Retreat in the heart of Hidden Creek! Move-in ready 3 bedroom, 2 full bath all brick home! Enjoy every bit of this 2385-square foot private sanctuary! Hardwood and tile floors throughout! Crown molding and trey ceilings. Delightful dining area adjacent to a large sunroom. Enter through French doors from the living room into the light and bright sunroom that is cooled and heated for comfortable enjoyment, perfect for entertaining guests. Adjoining the dining room is the well-designed upgraded 2013 kitchen. A cook's delight with granite counter tops and breakfast bar, designer back splash, hardwood cabinets, upgraded hardware, sink and fixtures. 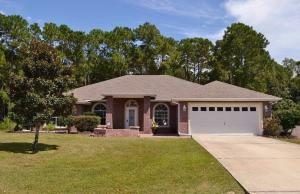 All Brick Home on Over Half Acre Corner Lot in Holley By The Sea!!! Beautifully, up-graded 3BR/2BA all brick home, features a split bedroom floor plan and offers the following amenities: decorator color; bullnose corners; engineered hardwood floor in Dining Room & Den/Office; washer and dryer, 2014 up-graded stainless steel appliances (flat-top range, refrigerator, dishwasher, microwave); soft closure cabinets; under and over cabinet lighting; tiled back splash; breakfast bar and plenty of counter space; separate breakfast room; Dining Room; double door access to large Den/Office; corner fireplace; cathedral ceilings; oversized master bedroom; Master Bath with tile flooring; full size seated walk-in shower; garden tub; double vanity and 2 walk-in closets. Your own retreat in Holley by the Sea! Relax with family and friends on your huge screened porch overlooking a natural wooded area. 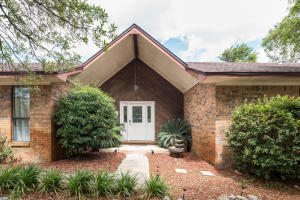 This home features high cathedral ceiling, decorator paint, tiled fireplace, large rooms throughout, formal dining room, French doors to both the screened porch and office, spacious breakfast room, kitchen with natural solid wood cabinets, stainless built in microwave & smooth top range, & breakfast bar. The master suite has a wing of its own, high trey ceiling, door to screened porch, garden tub, separate shower, double vanity, and two walk in closets. The ample guest bedrooms have their own wing with bath. Other features are irrigation system, gutters and utility sink. This home is ready to turn the key and move in! Mediterranean style pool home with circular driveway! 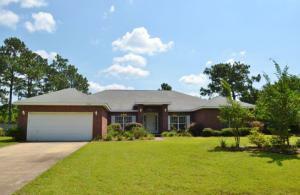 4 bedroom, 3 ½ bath plus office in Mary Esther Manor, centrally located to both Hurlburt & Eglin. Extra closet space throughout both levels. 2010 upgraded kitchen with granite countertops, tumbled tile backsplash, large pantry and a breakfast nook opens to the formal dining room. The Great room features sky lights and floor to ceiling brick gas fireplace which provide warmth that will be certain to make this room the homes centerpiece. Upstairs you will appreciate the 3 large bedrooms with 2 full baths and walk-in attic. The master suite located on the main level, has a large closet and features a whirlpool tub. The master opens onto a 9'x 30' Florida room.